Wednesday Night Dinner is this Wednesday at 5:30PM in the Great Hall! Also, our Wednesday night kids program lets kindergarteners through 5th graders enjoy a fun, loving, Christ-centered atmosphere filled with Children’s devotion, games, crafts, songs and more. Childcare is available for our younger children. — Preschool Registration for the 2019-2020 school year: If you are looking for a preschool for your child, we would love for you to check out our preschool right here at Eastminster Presbyterian Church. We have Covenant Partner Registration Week January 23-29. Members of the Church are able to register and select their class before we open to the public. Visit epres.org/classes-tuition/ to learn more, or contact Debbie Wilson, (debbie.wilson@epres.org) with your questions. We are wishing our Church family a healthy and Happy New Year. Registration opens to the general public on January 30. — Request forms are now live! Visit epres.org/request-forms to request an announcement be made, secure use of our facilities or begin the wedding process. Your request goes directly to the appropriate team who will be more than glad to help you! — Our Congregational Meeting is this Sunday at 5PM. We’re having a potluck dinner, and welcome you all to bring your favorite main dishes, sides and desserts to share with your fellow covenant partners. 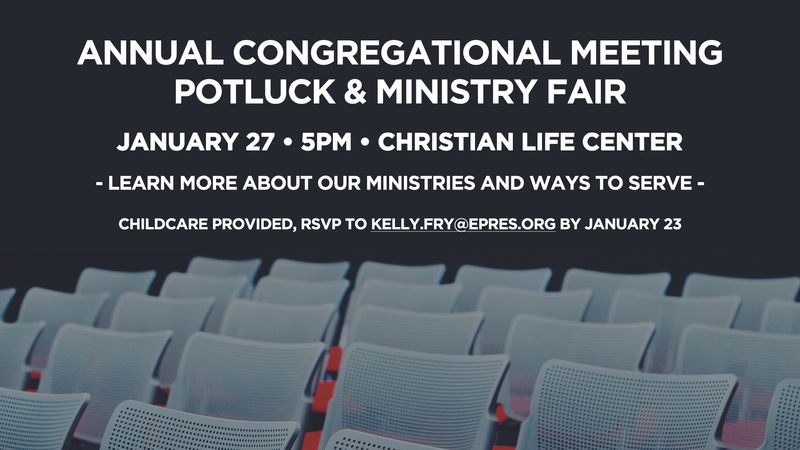 Also, we will have a ministry fair, where our various ministries will share helpful information about who they are, and how you can get plugged in.